Home » Latest News » Happy 100th Birthday British Vogue! Happy 100th Birthday British Vogue! On September 15th 1916, exactly one hundred years ago today, the first ever issue of British Vogue magazine became available on newsstands. 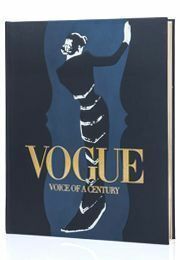 And to mark this occasion, today Genesis Publications is immensely proud to publish VOGUE - VOICE OF A CENTURY, a limited edition book created to celebrate and tell the story of one of the most influential fashion magazines in the world. Echoing its founding year, only 1,916 copies have been printed. "During the lifetime of British Vogue there have been many Vogue books published, but never one like this." Alexandra Shulman, Grace Coddington, Patrick Demarchelier, Kate Moss, Marie Helvin, Manolo Blahnik, Arthur Elgort, Paul Smith, Barbara Hulanicki, Barbara Daly, John Frieda, Eric Boman, Stella Tennant and Penelope Tree. Above: Alexandra Shulman and contributors discuss the new limited edition, VOGUE - VOICE OF A CENTURY.